Q. 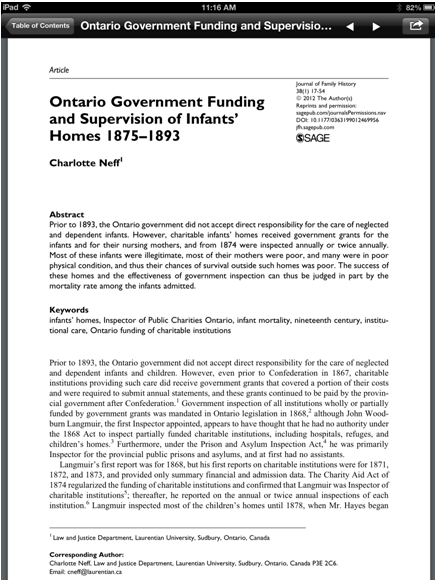 How can I monitor new issues of academic journals? The library often receives questions about how users can know when new issues of academic journals are published in electronic format. In the old days users would come to the library and peruse the journal shelves to see if any new issues had arrived. In the electronic age we need technology to assist us. Some publishers provide RSS feeds for individual journals, and users could "subscribe" to these news feeds in their RSS news aggregator. But there are problems with this solution, most notably the incompatibility of this solution with our proxy authentication systems. Browzine is an app for your tablet (iPad or Android). 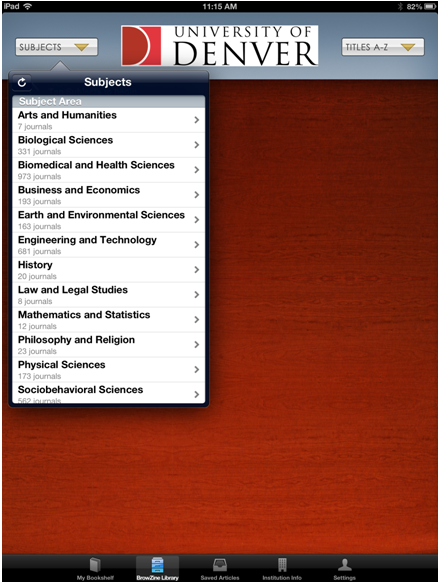 Simply download the free app, associate it with the University of Denver, login with your DU ID and passcode, and you will be able to search and browse for thousands of academic journals, read articles in full text, save favorite journal titles to a personal shelf, and save individual articles for reading when you are not online. Not every academic journal is covered, but you will discover that most are. Current publishers with content in BrowZine include: AAAS Science (American Association for the Advancement of Science); ACM (Association for Computing Machinery); ACS (American Chemical Society); AMS (American Mathematical Society); ASM (American Society for Microbiology); BioMed Central; BMJ (British Medical Journal Publications); Brill; Cambridge; CSIRO (Commonwealth Scientific and Industrial Research Organisation – Australia); Elsevier; Emerald; IEEE; IOP (Institute of Physics); JAMA Network (American Medical Association); JMLA: Journal of the Medical Library Association; Nature Group; New England Journal of Medicine; Oxford; Palgrave-McMillan; PLoS (Public Library of Science); Royal Society of Chemistry; SAGE; Springer; Taylor & Francis; and Wiley. New content is added on a regular basis.